Why was there no mention of the Affordable Housing Trust Fund in the 2019 capital spending plan for the Department of Housing and Community Development that Braverman had just reviewed, via a Power Point presentation, before the Planning Commission? “My question to Commisisoner Braverman is about the Affordable Housing Trust Fund, which was passed by voters more than a year ago with 180,000 voters in this city, and yet we have seen no funds put into it. That is unacceptable,” said Terrel Askew, of the Baltimore Housing Roundtable. “Is he prepared to put funding into it today?” Askew demanded, speaking at the end of Braverman’s remarks at a meeting where public comment was not on the agenda. 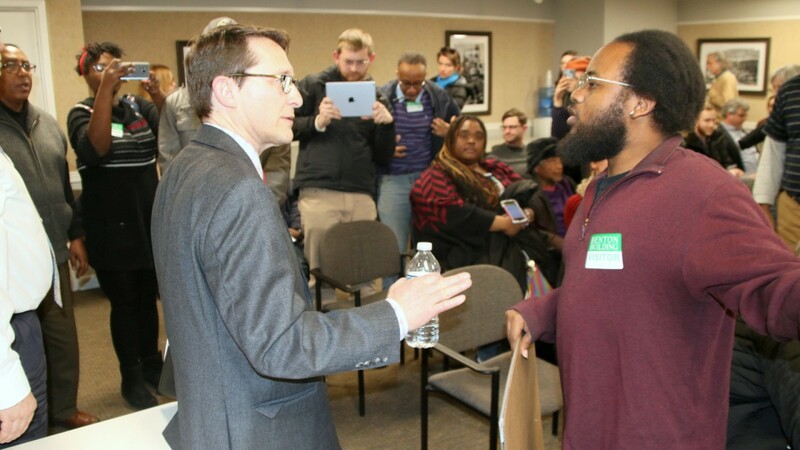 “Are you going to let him answer?” demanded the crowd of about 30 activists in the audience. With Tax Night many months in the future, the crowd erupted (“Tax Night is a joke!” “The question is long since decided by then!”) until Davis relented and Braverman addressed the question. “I can tell you I’m committed to finding answers. There’s not a tremendous amount of money,” Braverman added. He headed out to the lobby where the tense exchange continued. The issue is an urgent one for advocates who say lack of affordable housing is at the core of multiple miseries for low-income city residents, among them evictions, loss of homes though tax sales, and increased homelessness. 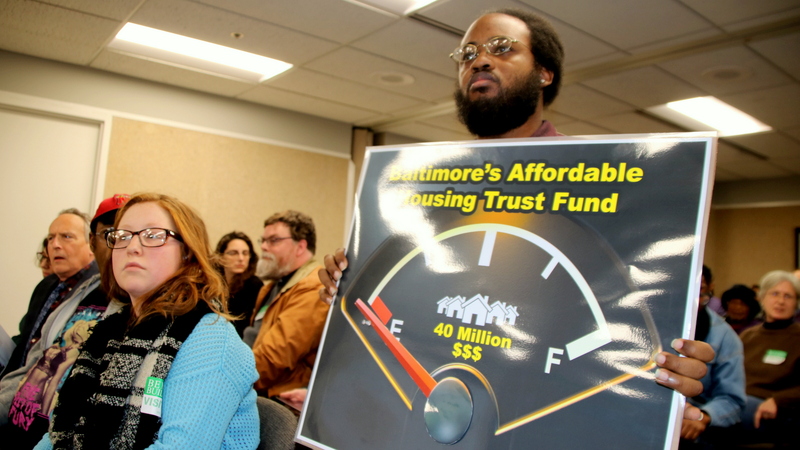 The Affordable Housing Trust Fund is the result of a broadly written ballot question, which voters approved in November 2016, that amended the city charter to create a fund to develop and maintain housing that low-income residents can afford. But 15 months later, as the capital budget discussed Friday demonstrated, the Pugh administration has not identified a source for the funds (various fees and taxes have been floated) or specified how to spend the money (new housing, renovation of existing housing, land trusts to keep mortgages and rents low). “It’s not a footrace to get to a deadline,” Braverman said, suggesting he’d be back to the group in 60 days. Nor has the administration created the 12-member commission the charter amendment called for to help the housing department administer the fund. “Names and resumes of potential housing fund commissioners were submitted in August. No movement on the city’s end. 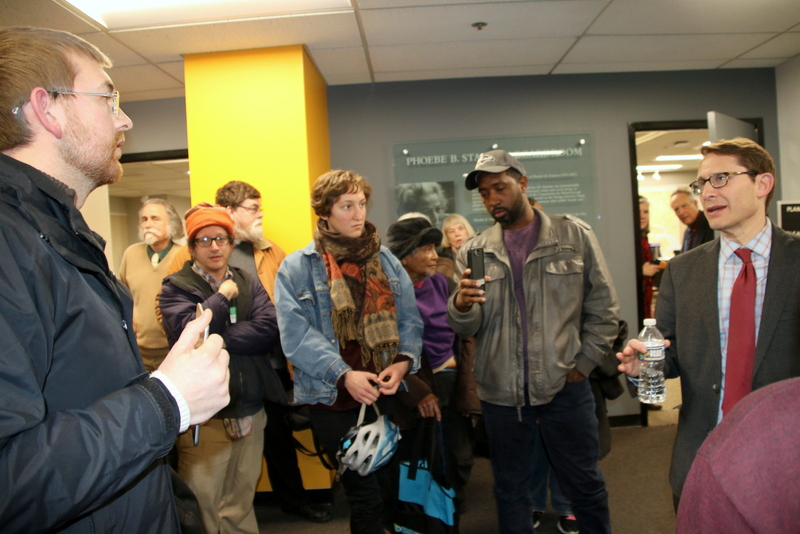 No response from the mayor’s office,” said Greg Sawtell of United Workers. It calls for the the city to float $20 million in bonds to create affordable housing and another $20 million to “deconstruct” vacant rowhouses, an approach to demolition that provides jobs and recycles materials. Last month, Pugh and the Board of Estimates approved $10 million in future bond money for affordable housing – an increase that fell far short of the amount the advocates want. “It’s not the $20 million that you’re asking for, but the question is, what sources of funds can be raised, and what’s the best way to leverage them,” Braverman said. Noting that he is the new head of a department that was recently split off from Baltimore’s Housing Authority, Braverman asked for more time. “It’s not a footrace to get to a deadline,” he said, suggesting he’d get back to the group in 60 days. That answer angered the Roundtable contingent, gathered around the commissioner outside the hearing room. With so little movement on the trust fund or the 20/20 Plan as the 2019 budget is being set, activists said Mayor Catherine Pugh is breaking a campaign promise, as she did with the $15 minimum wage issue last year. Watford pointed out that Mayor Pugh also backed the 20/20 Plan last May during a rally at the War Memorial Building. “It seems like the city’s strategy for those black neighborhoods is just demolition” – Activist Peter Sabonis. “The vision for 20/20 is one that I support,” Pugh had said at the time. Her office has not responded to a request for comment about her support for the 20/20 Plan and affordable housing. Asked what the city’s affordable housing strategy seems to be, attorney Peter Sabonis, a member of the Housing Roundtable, said he thought it was evident from Braverman’s presentation Friday. “It’s lots of demolition and it’s increasing property values across the board and strategically in certain neighborhoods,” said Sabonis, director of Legal Strategies at National Economic & Social Rights Initiative. That’s why he said activists need to press the administration on its failure to act on the Affordable Housing Trust Fund.